NETWORK FINALS: THE FLASH just barely gained 0.1 in final numbers (the less-rounded rating was 0.86), avoiding a series low. LEGENDS OF TOMORROW, however, lost 0.1. In addition, the 8:30PM AMERICAN HOUSEWIFE rerun went up 0.1. CABLE HIGHLIGHTS: BET’s REBEL premiered at 0.22. USA was in control of Tuesday cable, as WWE SMACKDOWN ticked down to 0.86, and CHRISLEY KNOWS BEST rose 0.05 to 0.78. On Bravo, REAL HOUSEWIVES OF BEVERLY HILLS held at 0.70, and IMPOSTERS fell 0.07 to 0.22. 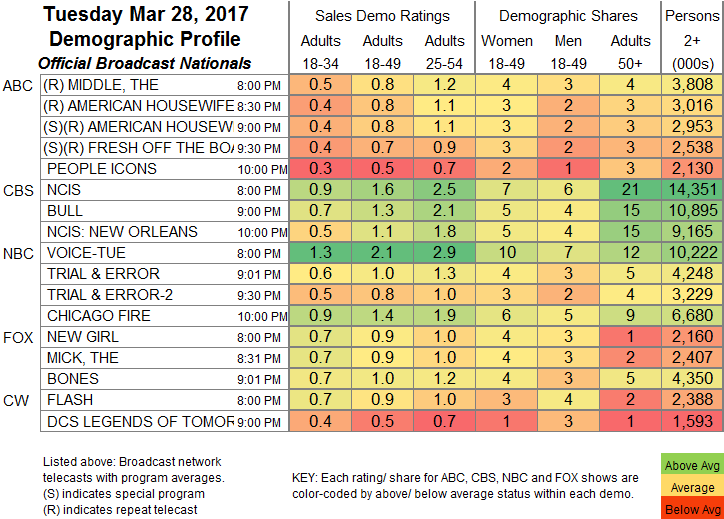 On HGTV, FIXER UPPER lost 0.06 to 0.68 (an 11PM after-show was at 0.29), and HOME TOWN was down 0.07 to 0.39. MTV’s THE CHALLENGE gained 0.03 to 0.52, and STRANDED WITH A MILLION held at 0.20. OWN’s IF LOVING YOU IS WRONG slipped 0.02 to 0.50. On TBS, THE DETOUR grew by 0.04 to 0.45. 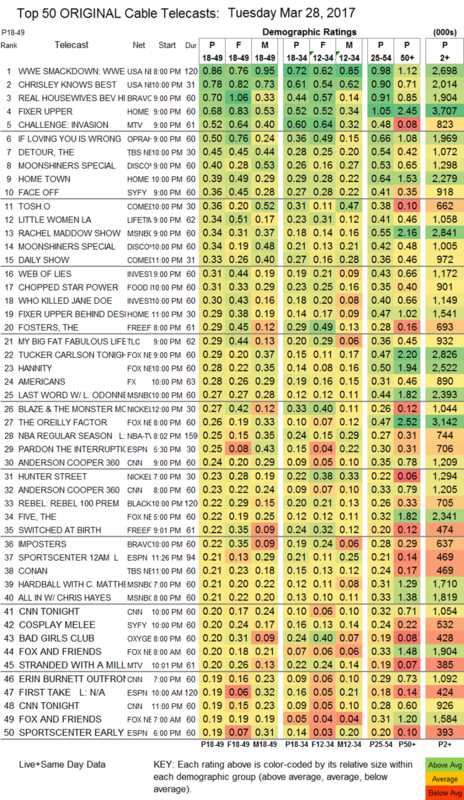 A MOONSHINERS special on Discovery was down 0.03 from last week’s special to 0.40, and another special followed at 0.34. Syfy’s FACE OFF climbed 0.03 to 0.36, and COSPLAY MELEE was up 0.05 to 0.20. Comedy Central’s TOSH.0 was steady at 0.36, and DETROITERS was similarly steady at 0.18. On Lifetime, LITTLE WOMEN LA remained at 0.34. Food Network’s CHOPPED lost a tick to 0.31. On Freeform, THE FOSTERS held at 0.29, and SWITCHED AT BIRTH stayed at 0.22. TLC’s MY BIG FAT FABULOUS LIFE gained 0.03 to 0.29, and SHE’S IN CHARGE was up 0.05 to 0.17. FX’s THE AMERICANS had a healthy 0.07 bounce to 0.28. Spike’s ADAM CAROLLA & FRIENDS fell 0.02 to 0.07.